Trade Windows Services Ltd is well-established supplier and installer of double glazed windows, composite doors, conservatories and orangeries. Our sister company TWS Verandas, highlights our expertise in creating outdoor spaces that are sheltered from the great British climate. The simple fact is that there are times when we would like to be outside but the weather doesn’t always make this easy. And then there are other times when we would rather have peace and quiet indoors but it just isn’t possible. With a great range of products and a wonderful design team, Trade Windows Services are there for every eventuality. Verandas, glazed canopies and smoking shelters from TWS Verandas are elegant, practical and beautifully crafted. There is no getting away from the fact that the English love their gardens. From hanging baskets to neatly trimmed lawns we spend many hours and no little expense on our little plots of land. It is no wonder that over the last 20 years we have seen a proliferation of patios, decking, gazebos and arbours. Garden centres and home improvement stores have sold millions of patio heaters and chimneas as we try to make the best of what we have. With the help of TWS verandas, home owners can now make their gardens a whole lot better. Verandas come in every shape and style including classical, traditional and contemporary designs. We create living spaces that are tailored to your lifestyle and built for your home. Our verandas can blend in or stand out. 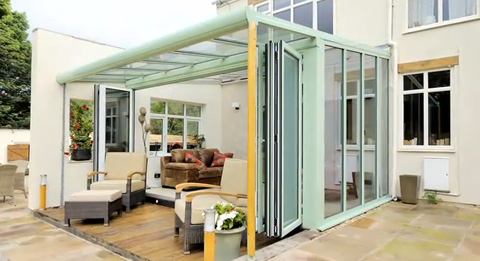 Using the latest glazed products we can safely enclose as much or as little of your garden as you choose. Whether you opt for open sides, half-glazed or a fully enclosed sunroom, the choice is yours. We can incorporate lighting and heating, fit for purpose and looking good. Verandas and Smoking Shelters for Restaurants, Cafes and Bars. One of the many benefits of the smoking ban has been to encourage restaurants, bars, cafes and pubs to think about the outside environment. TWS verandas design and build verandas and smoking rooms for customers in every area of commercial life. Our products can enhance a buildings’ existing features or create something new and different. A smoking shelter can be free standing or ‘lean-to’, with a pitched roof, dual pitch or curved roof to your own design. Smoking shelters from Trade Windows Services use high strength, scratch resistant, transparent polycarbonates. This is 200 times stronger than regular glass and gives great light transmission, even when using a coloured tint. TWS verandas are an Essex-based company but our teams of builders and craftsmen install smoking rooms, verandas, conservatories, windows and doors all over the UK. We are also able to provide our products on a supply-only basis for customers who prefer to use their own local fitters. TWS verandas, are happy to respond to customer requests and as a direct result we now offer a great range of glazed canopies and covered walkways. Glazed canopies are popular over patios, decking and driveways. Like our verandas and sunrooms we can add lighting or outdoor heating and all glazed units come with a wide choice of coloured glass (transparent polycarbonates). Glazed canopies and covered walkways are a practical feature for shops as they shelter prospective customers while they are window shopping or preparing to enter or leave the premises. Further information on all our products is available at www.twsverandas.com or to discuss your specific requirements call us on 01702 557137.